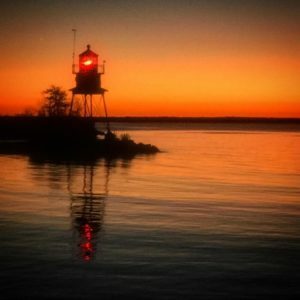 Little Red is the only lighthouse within the City of Alpena, and believed to be the only lighthouse of this type in the U.S. The station was built of wood in 1877, rebuilt of wood in 1888 and finally constructed of steel in 1914. It was added to the National Register of Historic Places in 2006. An automated active aid to navigation, the Alpena Light originally housed a Fourth Order Fresnel lens.